Oregon Center for the Arts at SOU brings creatives together to practice their individual artistic passions while inspiring one another across the disciplines. Whether you are heeding an inner call to put pen to paper, brush to canvas, note to staff, shoe to stage, or pixel to screen, you will find a welcoming home in one of our academic programs. This program can be completed in five years if a business minor is added to a Bachelor’s degree major from any of the arts programs available at SOU. This MBA program prepares artists to manage and lead on a local, regional or national scale and combines business strategy with community insights in innovative and resourceful ways to connect artists, the arts, and audiences in ways that transform their communities. Want to write creative nonfiction? Novels? Free verse or classical poetry? Whatever your genre, Southern Oregon University’s Creative Writing Program will give you the formal guidance and dynamic catalysts to equip you for the writing life. Want to make films, animations, or interactive stories? Enjoy mentorship from forward thinking professors who delight in their field. With opportunities to produce works of art spanning any and all genres, you can carve your own path through the emerging media and digital arts major. Be brave. This is your moment to find your deepest passion and dive in headlong. At Oregon Center for the Arts at SOU, you will be inspired to chart your own musical journey and fully express your creative self. Find such stuff as dreams are made as you delve into the life and works of the famous Bard. Watch the words of Shakespeare come to life on stage at the world-renowned Oregon Shakespeare Festival (OSF), one of the top five regional theaters in the country. Are you ready to enter a highly competitive theatre program that will propel you to the pinnacle of your talent? Whether your calling lies on stage, in the director’s chair, or behind the red curtain, you will discover your voice in OCA’s Theatre Program. Dance/Movement Studies is a suite of courses that will compliment your chosen degree and equip you with the techniques, skills, and practical experience to perform with confidence before an audience. As an additional area of study to compliment your chosen degree, you can pursue both music and theatre passions through Oregon Center for the Arts at SOU’s Musical Theatre Studies. This suite of courses will help ready your entry into the burgeoning world of musical theatre. Which medium speaks to your soul – painting, sculpture, ceramics, drawing, photography, or digital arts? 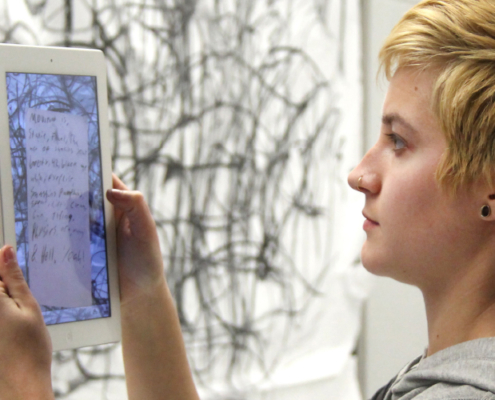 Explore to your heart’s content at SOU’s Visual Arts Complex cutting-edge facilities and study formal methods from internationally exhibiting artist-professors.